Ruru Lodge, Kotare House. Spacious, modern, light, convenient, fully fitted. 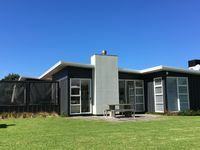 Property 18: Ruru Lodge, Kotare House. Spacious, modern, light, convenient, fully fitted. Self contained cottage with own access. Property 21: Self contained cottage with own access. 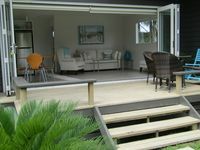 Property 22: Matakana peaceful rustic retreat. Joie de Vivre. Stunning and unique. Property 29: Joie de Vivre. Stunning and unique. Property 44: Absolute Beachfront Holiday Home! Property 49: Modern Home! Private Garden! The cottage is lovely and clean, modern with everything you need to be self contained. The property is beautifully landscaped and in a great location to explore the surrounding area. This was a great place to stay for 5 adults. Spacious, well set up with lots of great touches to make the stay easy. Great size fridge for all the holiday food and drink, lovely outdoor area to enjoy the sun. A gorgeous, clean and well presented home.